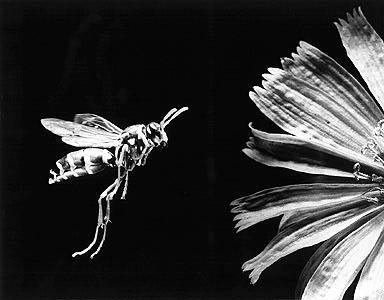 Making a photograph of a flying wasp is not as simple as simply aiming the camera and pushing the shutter button when the wasp is in the right place. Various problems must be tackled in turn. 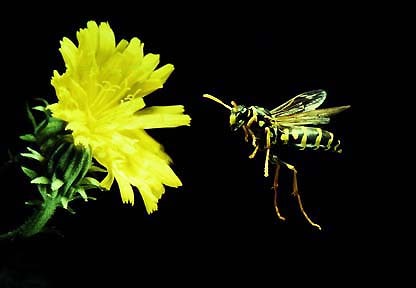 First, if the wasp is to have any significant size on the film a close-up photo needs to be made. This means a very shallow depth of field even when a small aperture is used and consequently the wasp must be located precisely at the plane of sharp focus otherwise the picture will be blurred. In this case I used a 135mm lens with about 50mm in extension tubes and operated the lens at a set aperture of f:16. The film was Kodak Ektachrome Plus or Kodak T-Max 100. 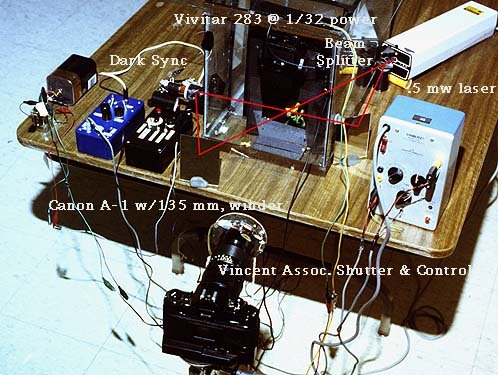 To solve some of the "positioning" problems, light from one laser was split into two parts and one half made to travel directly across the field of view of the camera and fall on a photocell attached to a "dark" activated synchronizer. The other half was directed with a small mirror so that it would travel at about 45 degrees across the first beam then by way of another mirror also onto the same photocell that the first half fell on. The camera was focused on the intersection on the two beams. The intensity of the beams was such that when either half of the beam was intercepted by itself the light level would not be low enough that the "dark" activation mode of the synchronizer would detect the event. Only when a wasp crossed the intersection of the two beams did the light level fall low enough for the synchronizer to immediately turn on. In order for the synchronizer to fire the flash the camera shutter would have to be left open waiting for the flash to go off. This measn that if there was any level of ambient light the photograph would be spoiled by overexposure to this ambient light. On the other hand, wasps do not fly in darkness. So, since the synchronizer itself could not fire the Vivitar flash set to 1/32nd power (to achieve a short exposure time) because the pictures had to be made with the ambient lights left on, the lens of the camera was covered with a fast opening electromechanical shutter (a Uniblitz shutter made by Vincent Associates in Rochester, NY) and it was this shutter that within 2 milliseconds of being activated by the synchronizer then fired the electronic flash. 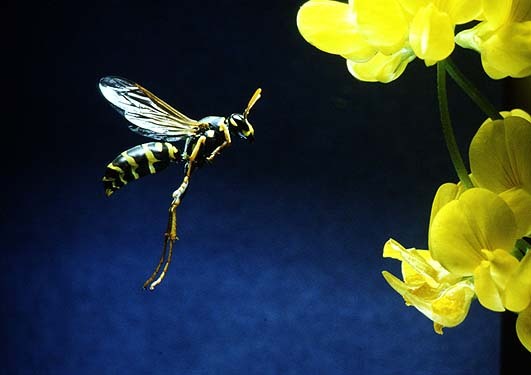 The flash was located about 6 cm from the flight path of the wasps. Directly below the flash head was a mirror reflecting the light back up to the wasps. Since the Canon camera's shutter had to be open all the time it's shutter was held open by another synchronizer, set to be activated by the light of the flash when it went off. The contacts of this synchronizer were "normally closed" until opened by the burst of light from the flash. These contacts were connected to the Canon's winder and they caused the shutter of the camera to remain open on "B" until they were opened when the synchronizer was activated. Keeping the Canon A-1's shutter open for long lengths of time would obviously drain the batteries so an external battery pack equipped with rechargeable AA cells, was attached to the camera's battery compartment. A wasps' nest was placed at one side of a restricted enclosure in a fish tank and sugar water at the other side. The wasps eventually started flying from one side of the tank to the other. Under normal conditions the camera's shutter was held open by the second synchronizer but the film was not exposed to light because of the capping action of the electromechanical shutter attached to the lens. Then, as the wasps sometimes flew through the point in space where the two laser beams crossed this activated the first synchronizer and the picture was made. The second synchronizer then briefly disconnected the shutter contacts allowing the camera motor to wind one frame of film. Immediately after winding the film the shutter was again opened by the second synchronizer whose contacts again closed. Thus one could walk away from the system and come back hours later to simply check on the frame counter. If the number was different than when one left it was a sign of the number of wasps that had photographed themselves by crossing the spot identified by the crossed laser beams. ..... actually a single synchronizer could have been used if I had had easy access to the relay contacts of the single synchronizer... but it was easier just to use a second one since I had it available. The Vincent Associates Uniblitz shutter is an electromechanical shutter with a VERY brief time delay between time power is applied to its magnets and the time the 25mm diameter opening is fully open. This delay is about 2 milliseconds. This company sells its products primarily for laser control applications but it obviously serves for applications like this one quite well. Vincent Associates has a website at: http://www.uniblitz.com/main/index.cfm - Tell them I sent you ... I think they will remember they helped me out once many years ago when I was still a student! The synchronizer used for this project was designed and built in the High Speed Laboratory at the School of Photographic Arts and Sciences and the schematic, PC board, parts list and rudimentary troubleshooting instructions for the Dark activated Synchronizer that I used for this project is given below.. It actually also works in "Light Activate" mode and can also be turned into an intervalometer. Commercial dark activated synchronizers devices such as the Wave Sensor by LPA Design and distributed by Bogen, as well as the Dale Beam or the Shutter Beam would be appropriate for this purpose. The Kapture Group also sells a very sophisticated sync system. Suppliers are listed at end of article. (c) A.Davidhazy * non-commercial use and distribution ok! Attempt to build at own initiative and risk. No guarantee you will succeed or that it will work for you. A student who built one of these asked: Now, if I'm looking at the box, with the three switches on the top (on/off switch on the left), what do the switches and knobs do again? I got it to work once, but then I started playing around, and messed it all up. 2. one REPEAT switch (it makes the device "cycle" over and over once the process has been started. 3. one Two position switch that selects whether the device responds to light or darkness. 5. one delay timer potentiometer. Anyway, what I would do is first is to try to identify the ON/OFF switch. Make sure you do NOT have the light sensor plugged into the unit. Then the other ones are the repeat switch or the synch selector swith. To decide which is which start out however they are set now. Turn both "knobs" fully counterclockwise. Then note if one of the led's comes on or not. Also note whether the device starts "cycling" or whether one of the led's remins lit for a long time. If so, then turn the knobs, one at a time, and see if you can make the cycling time change. The knob that causes the timing to change is the "time delay" knob. Label it. The other one is the sensitivity knob. Label it. If the above does NOT happen, then keeping the switches where they were turn the knobs fully clockwise. One or both led's should turn on now. If so proceed as above. If not then change the position of the two switches and repeat above procedures. Turn the knobs back and forth. This should cause one of the led's to turn on and then off. That knob controls the sensitivity. Label it as "sensitivity". And label the direction in which you turn it that causes the led to turn on, the "high" side. The switch setting where the turning of that knob causes one led to turn on and off is the setting for "dark" activation of that switch. Label it, one side "dark sync" and the other "light sync". The other position of the switch is "light" activation. (Although you will not be able to detect "light" because I have told you to do all this with the light detecting device unplugged). So, by now you will have labeled ON/OFF, repeat ON/OFF, ligh and dark sync, delay timer and sensitivity. A total of 5 items will have been labeled by a process of elimination. If you still have problems you can contact me here: andpph@rit.edu and I will try to provide assistance.